Written by Alvin Y. So. Hong Kong was a British colony for one-and-half century. After 1997, Hong Kong became a Special Administrative Region (SAR) of China. China promised the former British colony a policy of “One Country, Two Systems,” guaranteeing that “Hong Kong people ruling Hong Kong” and Hong Kong would enjoy a high degree of autonomy with no change of the existing its political and economic institutions for 50 years. By all accounts, the 1997 transition in Hong Kong was pretty smooth. Even though Hong Kong worried about the imposition of communist rule and Fortune magazine proclaimed “The Death of Hong Kong after 1997,” Beijing did largely keep its promise, adopted a position of non-interference towards Hong Kong affairs, and allowed Hong Kong to have a high degree of autonomy during 1997-2003. In fact, right after the handover, Hong Kong people began to find Beijing more trustworthy than before, and they identified themselves as Chinese nationals in this period. However, a militant anti-china movement suddenly emerged in Hong Kong since the late 2000s. Mainland tourists and immigrants were labelled as “locusts” because they take away Hong Kong’s precious resources. Hong Kong fans started to boo the Chinese national anthem at international soccer matches in 2015. Soccer fans wore T-shirts and held signs with slogan “Hong Kong is not China”. In 2016, this anti-mainland sentiment and movement further led to the formation of new political organization (e.g., Hong Kong National Party), which declared that political independence of Hong Kong should be openly discussed and considered. Naturally, Beijing labelled these new organizations as separatists which posed threats to national security. What explains the emergence of anti-China movements and pro-independence organizations in Hong Kong? Why Hong Kong`s integration with China suddenly got astray in the late 2000s? It seems 2003 is the turning point for Hong Kong’s post-colonial development. On July 1, 2003 an estimated 500,000 people came out on the street to protest against Article 23 (the anti-subversive law) because the Article would threaten the freedom of association and expression, threaten the freedom of information and the free press, and endanger the freedom of speech and religion. Since the Hong Kong SAR government was seen as incapable, Beijing decided to take the lead in solving the economic and political crisis in Hong Kong. In 2003, Beijing dropped its non-intervention policy and started a new state-led integration process to speed up and to deepen Hong Kong’s integration with mainland China. In particular, Beijing initiated the following policies: (1) an “individual traveller’s scheme” to allow mainlanders to visit Hong Kong on a personal basis; (2) A CEPA (Closer Economic Participation Arrangement) which provided Hong Kong-made products with tariff-free entry into the mainland China market; (3) several mega infrastructure projects (like the Hong Kong-Macao-Zhuhai Bridge and the Guangzhou-Shenzhen-Hong Kong Express Rail Link) connecting Hong Kong to the cities in the nearby Pearl River Delta and other cities in mainland China. In addition, Beijing also began to intervene politically in Hong Kong affairs. In 2012, a new national education curriculum was introduced in secondary school on the ground that many young people grew up with a lack of national education, coupled with sentiments against the Communist Party of China. In 2014, Beijing released a White Paper on Hong Kong stating that Beijing has ‘complete jurisdiction’ over the territory and is the source of its autonomy, National People Congress (NPC) further decided that China would tightly control the nomination of candidates for the election of Hong Kong’s Chief Executive in 2017. 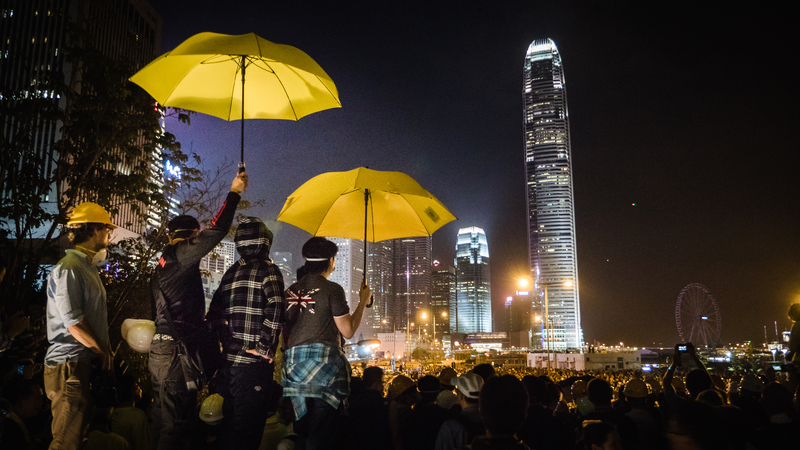 The above intensification of the national integration processes, however, has unintentionally led to the emergence of anti-mainland protests in Hong Kong since the late 2000s. This new wave of anti-mainland protest is characterized by its target against mainland tourists and immigrants, its militancy, its protest location in the New Territory, and its grassroots participants. For immigrants, 150 mainlanders would get a one-way entry permit to legally reside in Hong Kong each day after 1997, many of whom are wives and children of Hong Kong residents. This amounts to about 55,000 mainland immigrants every year or 0.55 million mainland immigrants every decade after 1997. For tourists, the number of individual tourists from mainland China was only 4.3 million in 2004, but the number of tourist has quickly jumped tenfold to 47 million in 2014. This massive influx of tourists and immigrants has sparked new social tensions in Hong Kong society. A lot of “hot money” also followed mainland immigration and tourism, pushing property prices to record levels. In December 2016, for example, mainland conglomerate HNA Holding Group has outbid 20 Hong Kong rivals to win its second residential site in Kai Tak for a record HK$13,600 per square foot. This influx of mainland hot money has led to a 201 percent increase of the cost of residential land in the area from HK$4,913 per square feet in June 2013 to HK$13,600 per square feet in December 2016. Many Hong Kong workers and middle-class professionals complained that they could not afford to buy homes due to the mainlander housing bubble. In addition, when mainland spenders arrived in droves to purchase luxury goods (e.g., jewelry and brand name items), major shopping malls saw a mushrooming of high end boutiques catering to this influx of nouveau riche wealth and consumption habits, driving up rents and knocking small local shops out of business. Mainland visitors were also very interested in other basic necessities (e.g., drugs and milk powder), believing that Hong Kong had better quality control. When mainland China was plagued by the tainted baby milk scandal in 2008, mainland visitors descended on Hong Kong supermarkets and drug stores, causing a temporary shortage. Hong Kongers complained that they were subsidizing the costs of mainland tourists (in term of crowding in public transport and long lines in the bus station) while only the large chain stores were reaping the financial benefits from tourism. Chiefly among their worries were rising housing prices, particularly the cost of housing and rising rent over the past few years. In addition, Hong Kongers said they were forced to pay higher “tourist prices” for local restaurants and other goods as a result of the influx of mainland tourists. Hong Kongers also accused mainland tourists of violating certain codes of civility that they have long taken for granted. Mainland tourists, they say, jump lines, defecate in the street, and talk loudly in public places. Furthermore, Hong Kongers complained that stores catering only to the needs of mainland tourists who flood their local neighbourhoods. Thus, Hong Kongers advocated the preservation of local communities, local style of life, and local values in response to the devastating onslaught of mainland tourists. Furthermore, the competition for scarce resources aggravated hostility against mainlanders. For years, pregnant women were allowed to give birth in Hong Kong hospitals, regardless of their nationality after paying a surcharge. The child would automatically acquire Hong Kong permanent residence status, even if neither of the parents was a Hong Kong resident. After the “Individual Visitor Scheme” was introduced in 2003, tens of thousands of mainland mothers came to Hong Kong to give birth, to take advantage of better medical facilities and make their children eligible for all the welfare benefits accorded permanent residents in Hong Kong. Identifying themselves as “localists,” anti-mainland protesters openly condemn the traditional movement activists and the pan-democrats as “left rubbers” (or “Greater China sympathizers”) and criticize the latter’s peaceful, democratic method as out-dated and useless. Instead of paying attention to the democracy movement in mainland China, anti-mainland protesters argue that the pan-democrats should re-oriented its focus on Hong Kong’s local affairs. In other words, the pan-democrats should, following the path of anti-mainland protesters, put forward the slogan “Hong Kong First” or “Hong Kong Priority”. In response to the growing anti-mainland sentiment in Hong Kong society, many new political organizations (e.g., Youngspiration, Hong Kong Indigenous, and Hong Kong National Party) suddenly emerged. In 2016, these new political organizations were openly advocating for the platform of Hong Kong Independence. In August 2016, a 2,500 people rally – dubbed as the “first pro-independence rally in Hong Kong” – was held at Tamar Park, outside the Hong Kong government headquarters in Admiralty. These new anti-mainland organizations sent genuine shockwaves through the political establishment by winning the bi-election of the Legislative Council (Legco) in February 2016. This bi-election result was soon followed by the victory of several more pro-independence candidates in the Legco election in September 2016. Beijing’s reaction to this nascent pro-independence movement in Hong Kong society is to adopt a “red-line” policy to place national security, territory integration, and sovereignty as the top consideration. Beijing is determined to punish pro-independence activists harshly and to ban all the pro-independence activities in Hong Kong. For example, Wang Zhimin, Beijing’s chief representative to the city, called for a “zero tolerance” approach to calls for Hong Kong independence, saying there was no room in China or “in the whole world”. In his marathon speech to the Communist Party congress in Beijing in October 2017, General Secretary Xi Jinping issued a warning to the pro-independence or other so-called anti-China elements not to challenge the authority of the central government. Xi also vowed to foster greater patriotism and a stronger sense of national identity among the Chinese citizens of Hong Kong. What is the prospect for Hong Kong independence? Beijing’s hardline policy may work in the short run to push all the pro-independence activities underground. Nevertheless, it is doubtful whether it will work in the long run. Banners calling for Hong Kong Independence have surfaced at several universities in the summer of 2017, and Hong Kong soccer fans still turned their back, booed, and even raised their middle fingers as Chinese national anthem was played. After all, the ruling Kuomintang tried very hard in the 1960s-1970s to impose a very repressive policy to ban pro-independence activities in Taiwan, but the Taiwan independence movement still flourished and transformed to Democratic Progressive Party to defeat the Kuomintang. Unless the structural contradiction embedded in the national integration process is resolved, it seems likely that anti-mainland localism and Hong Kong independence sentiment and movement will come back with a vengeance at a later stage. Alvin Y. So is Chair Professor of Social Science at the Hong Kong University of Science and Technology. Image credit: CC by Wikimedia Commons. Let’s draft a specific socio-political theory/framework. On one side of a border you have a small, well developed, free society and on the other side a large, less developed, less free society. The border regulates and consequently restricts the flow of persons and the flow of money, such protecting the relative advantage and the internal coherence of the small society. When restrictions on the border are removed faster than the differences in development and freedom between the two societies shrink then resentment arises and social unrest ensues because the massive influx of people and money from the large society into the small society creates imbalances that benefit a minority there but disadvantage the majority. The process, illustrated for Hong Kong in this article, fits well with the framework. Taiwan’s relationship with China seems to follow the same pattern. Another similar, but less extreme, example might be the migration of Poles into Great Britain. I often get surprised by the ferocious resentment towards Chinese and Poles expressed in my conversations with Taiwanese and Brits. There are several remedies available to contain the conflict. First, reverse the opening of the border. Great Britain chose this option by its decision to leave the European Union. Second, freeze the status quo. Taiwan chose this option in the aftermath of the Sunflower Movement. The unease of the Taiwanese did not go away but it did not get fuelled further either. Third, suppress unrest. China apparently prefers this option. Since this strategy seems to work for the CCP in Tibet and Xinjiang, they probably will stick to it in Hong Kong, too. Consequently, peaceful demonstrations and protests are going to be replaced by violent insurrection gradually.